﻿ How to hot fix when there are biggest and smallest size stones on the motif? 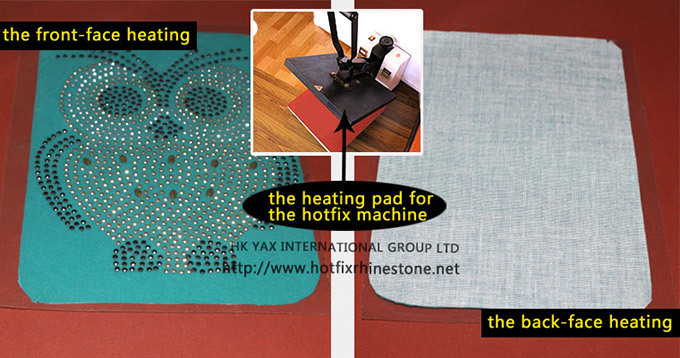 Your here： Notice » How to hot fix when there are biggest and smallest size stones on the motif? E.44 How to hot fix when there are biggest and smallest size stones on the motif? How to hot fix when there are biggest and smallest size stones on the motif? In the motif of my client, there are stones in SS4 and SS40, which were not stuck well on the clothing, how can i do? 1. if the distance between SS4 and SS40 is very narrow, this is the defective technique design, it needs to adjust the press to be higher to make the SS4 stones touch the fabric effectively. If the SS40 glue does not melt at all, and there are no glue on the fabric, perhaps it is because the temperature is too low, and the time is too short. If the SS4 stone glue is too melted, and the SS40 is stuck well, it is because the temperature is too high to the SS4 stone, the time is too long as well. Why do these two conflict situations happen? It is because the heating temperature to SS4 and SS40 differs too largely. The SS4 requests 140 degree 13 seconds, while the SS40 is 160 degree and 20 seconds. The most effective solution to this problem is to heat transfer from the back! How to transfer when there are biggest and smallest size stones on the motif?